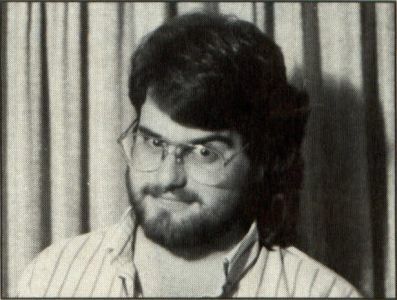 Footnotes: I Was a Teenage SYSOP! I Was a Teenage SYSOP! During a recent summer, strange and horrible experiments took place at my house. Awful things. Terrible things. Things to fray nerves, to make skin crawl, and to keep one awake a night. I became a. . .SYSOP. A system operator (or SYSOP) is a person who runs, at great personal expense and little personal gain, a bulletin board system (BBS) from his house. A BBS is a fiendish concept designed to take all your computer equipment away from you: You set up your computer with a program to accept outside calls over your modem. Aw, who cares? I have a BBS. That first day, still giddy with the thrill of it all, I sat in front of the screen and waited for someone to call. I waited and waited and waited. Then I waited some more. I did a bit of waiting until I finally decided to wait. After that I waited, then did some much needed waiting. Eventually, people did start to call. Usually, in the middle of the night. I know they called in the middle of the night because when they did, my modem gave a sound approximately equivalent to a teakettle whistle fed though an amplifier. Then my drives ran for about half an hour. Grind, grind, whirr. Maybe this wasn't going to be as much fun as I had thought. The joy of losing my computer to the BBS quickly became the indifference of losing my sleep to a noisy modem, which quickly became the horror of watching my drives catch fire from the heat of being on 24 hours a day. Mike, my friend, phoned up and said, "You might want to keep a cooling fan on them. Those older drives weren't designed to run that long." After an afternoon of pure panic, I got the drives back up, and the BBS was running again. I pointed a vintage World War II fan at the cooling vents on my drives and hoped for the best. "The best" turned out to be a sleeping environment that rivaled being strapped to the wing of a Cessna. At least the BBS was running. Sort of. A good SYSOP is 30% moderator, 30% comedian, 30% encyclopedia and 30% programmer. If you noticed that that comes out to 120%, you'll know why there are so few really good SYSOPs. Hide it though I tried, somehow it leaked out that I was not a good SYSOP: Maybe it was the fact that all the downloads disappeared one day or that message bases would suddenly spontaneously combust or that all the electronic mail was delivered to the wrong people. Complaints started coming in. People asked Mike to take back the BBS so that it could be in competent hands again. I paid 80 bucks to have a line installed for this? I was determined to improve, though. Mike kept saying that this was an acid-test for his home-brew BBS program; if I could handle it, anybody could. Finally, after spending about three hours a day for a week on the silly thing, the situation started to improve. The message bases were running smoothly; the number of callers was picking up; people seemed satisfied. This, of course, is just about the time the data disk chose to get a bad sector. When a BBS data disk gets a bad sector, it's the approximate equivalent of a brick wall suddenly appearing in front of a speeding car. Things rapidly went higgly-piggly. As I was attempting to straighten out the bad sector mess, I accidentally erased the message allocation map, the thing that tells the computer where each message is on the disk. This is the equivalent of dropping seven tons of cement blocks on top of the car that hit the wall. As I recall, I screamed a lot. The BBS was a complete mess. I've seen explosions with more organization. And so I took the chicken's way out: I reinitialized the system. I took everything and started over. This had only been done three times before in the history of the S.W.A.M.P.S., in its three years of existence. I did it after three weeks. And after messing up, I did it again. Three times. That's got to be some sort of record. It became sort of a running joke: Russian BBSing, you stood a one-in-six chance of having the S.W.A.M.P.S. be up. It was an elevator BBS: It's up! It's down! It's up! If the BBS blows up while you're online, you win a prize! Finally, six weeks after I took the monster over, Mike wanted it back. The price of forwarding all the calls from his number to mine was higher than he had expected. When I first took over S.W.A.M.P.S., I had visions of my own BBS dancing in my head once I gave Mike his board back. I would set it up and run it and everything. It would be my BBS. Though I did enjoy running the S.W.A.M.P.S. (believe it or not), I realize now how much work goes into it. I had always respected SYSOPs before, but I had never realized how much they go through every day keeping those beasts up and running, just so users can call—and for free, at that! When you call BBSs, be kind to the SYSOPs, respect their rules and give them support. The life of a system operator is not easy. And I, personally, would rather have my nose cut off than run my own BBS. Greg "Maddog" Knauss, 21, lives in La Jolla, California and attends the University of California, San Diego. He says he is feeling much better. ST-LOG invites all authors to submit essays for possible use in the Footnotes department. Submissions should be between 1,000 and 1,500 words and may be on any aspect of Atari computing. Any style or type of essay is acceptable—opinion, humor, personal experience—but creativity is a plus. Send your submission to: Footnotes, c/o ST-LOG, P.O. Box 1413-M.O., Manchester, CT 06040-1413.